A twist on the classic chicken soup, this traditional egg-lemon-based soup is a village favourite in the Mediterranean. In a pan, heat the oil over medium heat, and add the onions, cooking them until they are clear, approximately 5 minutes. Set aside until later. In a large pot, place the chicken, and cover it entirely with water. Add the carrots, bay leaf, celery and garlic clove. Bring to a boil, and reduce the heat to low. Skim the top as needed. When the chicken is cooked through — approximately 45 minutes to 1 hour — remove everything from the broth. Let the chicken cool before separating the meat from the bones and shredding it. Add the rice (or orzo) to the broth, bring it to a boil, and then let it simmer until al dente. Add the onions into the broth, with more water if need be. In a small bowl, beat together the lemon juice and eggs. Pour 2 cups of broth slowly into the bowl, whisking continuously to avoid cooking the eggs. Once all the broth has been added, pour the mixture into the pot of broth, and stir well. Sprinkle in salt and pepper while blending all together. 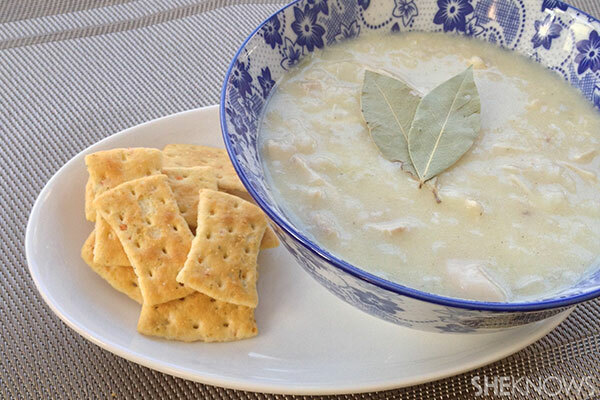 Traditionally this soup is served without the chicken, but feel free to toss it back in. Or turn it into another meal, and make club sandwiches.